A bicycle helmet helps in protecting the head of a cyclist from injuries caused by falls and impacts. Unlike a motorcycle helmet that encloses the whole head, a bike helmet is lightweight and well ventilated. Riding a bicycle is an aerobic activity which increases body temperature significantly. The head should be properly cooled down and temperature regulated since complications such as fainting spells and dizziness may occur. Despite the obvious protection that a bike helmet can offer, there are still ongoing debates on whether bike helmet use should be mandatory or optional. Those that are against mandatory helmet use state that riding a bicycle is intrinsically safe and what makes the activity dangerous are the public roads and highways. One of the most criticized report is the study released by Robert S. Thompson, M.D., Frederick P. Rivara, M.D., M.P.H., and Diane C. Thompson, M.S. in the New England Journal of Medicine in 1989. "A Case-Control Study of the Effectiveness of Bicycle Safety Helmets" or "TRT 89" as it is sometimes called is said to be the most quoted study with regards to bicycle helmets and was crucial to the passage of helmet legislation across the world. Critics of the report raised issues such as bias among the authors towards helmet use and data manipulation to come up with more favorable results leaning towards a pro-helmet stance. Data such as the often criticized and also cited 85%/88% statistic came solely from this report. It has been quoted and repeated in other reports while some question the validity of the statement. The 85%/88% states that the use of a bicycle helmet reduces head injuries by 85% and brain injuries by 88%. Just recently, Olympic Gold medal winner Bradley Wiggins called for legislation making it compulsory for cyclists to wear helmets in the UK. This was announced after a cyclist died in a crash near Olympic Park in London. It is unsure whether or not the cyclist was wearing a helmet. A favorite physical activity engaged in by Americans is bicycling, and children are perhaps its most ardent participants; it has been estimated that 70% of children ages 5 to 14 ride bicycles. Bicycling is not without its dangers, however, and one of the worst is the risk of head and brain injury during a crash. According to the US Centers for Disease Control, head injury is the most common cause of death and serious disability from bicycle crashes. The best protection offered to mitigate this injury is the bicycle helmet. However, few cyclists wear helmets regularly, and children are less inclined to wear helmets than adults: national estimates of helmet use among children range from only 15% to 25%. To determine just how effective bike helmets can be, neurosurgeon Tobias Mattei and his research team at the Illinois Neurological Institute and Bradley University tested how well helmets withstood forces of impact and crush tests when covering human cadaver skulls. They found that wearing a helmet can substantially reduce (by up to 87%) the acceleration experienced by the skull during an impact and can aid the skull in resisting forces up to 470 pounds in a crush accident. Full details on the results can be found in "Performance analysis of the protective effects of bicycle helmets during impact and crush tests in pediatric skull models. Laboratory investigation," by Mattei and colleagues, published today online, ahead of print, in the Journal of Neurosurgery: Pediatrics. The researchers tested impact and crush injuries sustained by cadaver skulls alone and skulls outfitted with bicycle helmets. The investigators chose human cadaver skulls for these tests because of the skulls' anatomical equivalency with the heads of living persons. The skulls were filled with BBs and resin cement to provide a uniform weight of 4 pounds. The investigators used an apparatus that could test both impact and compression injuries. To test the effect of an impact injury, each skull was outfitted with a standard children's bicycle helmet and suspended upside down on a carriage of the test apparatus. The skull and helmet were released in free fall from heights ranging from 6 to 48 inches, landing on a flat steel impact anvil. Unprotected skulls were also tested in falls from 6- and 9-inch heights. Helmet use was found to reduce impact acceleration up to 87% at a drop height of 6 inches (and more than 76% at a drop height of 9 inches). Translating these data into real-life effects, the authors state that wearing a helmet can reduce the force of a head impact during an accident occurring at 30 miles per hour to the force of a head impact occurring at 7 miles per hour. Compression injuries in bicycle accidents do not occur as often as impact injuries, but they can be devastating. To test the ability of helmets to protect the skull during a compression accident, the researchers used a pneumatic air cylinder. Together the skull and helmet were placed on their sides on a platform underneath the pneumatic cylinder, and the cylinder was set at various loads of compression to identify the maximum load that could be sustained without damaging the skull. The test was repeated using the skull without a helmet and again using the helmet alone. The helmeted skull was able to withstand a 470-pound force; the helmet alone displayed initial cracking at 100 to 200 pounds force. Disastrous consequences occurred when the unprotected skull was subjected to a high compression load. Based on the test results, Dr. Mattei, the lead author of this study, offers this advice to parents sending their children out to play on bicycles: "Parents must be aware that it is their responsibility to provide and assure that all available safety measures are taken when allowing their children to participate in any kind of social activity or sport. Bicycling is not different! Parents should teach by example, and their children will easily learn what measures must be taken to protect themselves. 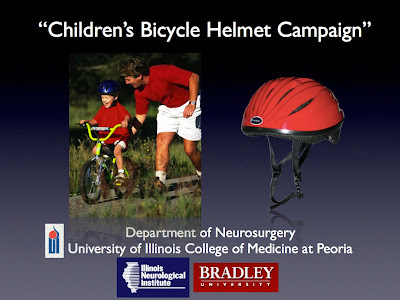 The objective of this benchmark investigation was to provide scientific validation for an educational "Children's Bicycle Helmet Campaign" (see figure) by providing precise and quantifiable measurements of the protection afforded by bicycle helmets. The results we obtained in our study provide strong scientific evidence for the sometimes-neglected common-sense belief that bicycle helmets significantly increase children's safety. 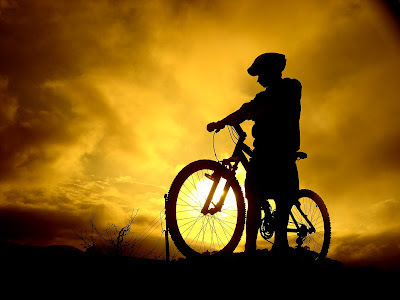 As neurosurgeons, we are sometimes able to lessen the deleterious life-lasting effects of traumatic brain injuries that may occur in bicycle accidents. However, there is no doubt that the best strategy is still prevention, which in this case may be accomplished cheaply and simply by regular helmet use."